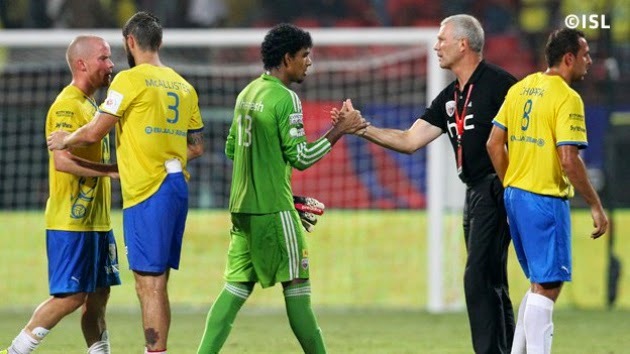 Kerala Blasters stay just outside the top four after playing out a goalless stalemate with NorthEast United FC in Kochi on Thursday night. The result leaves the Highlanders who are on 14 points, on the brink of elimination, while the fifth placed home side are tied on 16 points with fourth placed Pune City FC. It was a cagey beginning to the match with both teams having equal spells on the ball. The home side however soon asserted their dominance with their greater hold over possession. Iain Hume was a major threat to the opposition defence as he bombed forward time and again with support from Milagres Gonsalves and Penn Orji. The former Canadian international striker even had the ball in the net but was flagged offside. The visitors began to get better as the game progressed but were unable to get that important goal. Felipe de Castro even had a long range shot saved by Sandip Nandy at the end of the half.